This week particularly highlighted the bifurcation between those parts of the US economy most exposed to the global slowdown, and those most focused on domestic consumption. June was revised upward by +14,000. July was also revised upward by +30,000, for a net change of +44,000. The more leading numbers in the report tell us about where the economy is likely to be a few months from now. These were very positive. the average manufacturing workweek rose 0.1 hours from 41.7 hours to 41.8 hours. 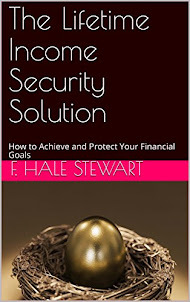 This is one of the 10 components of the LEI and so will affect it positively. construction jobs increased.by 3,000. YoY construction jobs are up 217,000.
manufacturing jobs decreased by -17,000, and are up 128,000 YoY. Professional and business employment (generally higher-paying jobs) increased by 33,000 and are up 643,000 YoY. temporary jobs - a leading indicator for jobs overall - rose by 10,700.
the number of people unemployed for 5 weeks or less - a better leading indicator than initial jobless claims - fell by -393,000 from 2,488,000 to 2,095,000, making a new low for this expansion. Overtime fell -0.1 hour from 3.4 hours to 3.3 hours. the index of aggregate hours worked in the economy rose by 0.4 from a downwardly revised 103.6 to 104.0. The broad U-6 unemployment rate, that includes discouraged workers declined -0.1% from 10.4% to 10.3%. the index of aggregate payrolls rose by 0.9% from a downwardly revised 123.7 to 124.6.
the alternate jobs number contained in the more volatile household survey increased by 196,000 jobs. This represents an increase of 2,585,000 million increase in jobs YoY vs. 2,919,000 in the establishment survey. Government jobs rose by +33,000. the overall employment to population ratio for all ages 16 and above rose +0.1% from 59.3% to 59.4%, and has risen by +0.1% YoY. The labor force participation rate was unchanged at 62.6% and is down -0.3% YoY (remember, this incl udes droves of retiring Boomers). Only two things held this report back from being Totally Awesome! The first is the headline 140,000 private jobs created, but as most readers probably already know, August numbers have had a history of major upward revisions. The second - sigh - once again is wage growth, which despite a 5.1% U3 unemployment rate is unable to crack 2%. This is terrible and continues to bode ill for the next recession whenver it may come. I still expect this situation to improve once the broader U6 unemployment rate, which fell again this month, finally falls below 10%. Everything else was damn near, well, awesome. Not only did both unemployment rates fall to new lows, so did short term unemployment (a leading indicator), and those not in the labor force but want a job now fell to a new post-recession low save for one month. Involuntary part time workers did go up, but still are at the second-lowest number since the recession. The manufacturing workweek improved Manufacturing and mining employment did fall, but were more than offset by gains elsewhere. Both aggregate hours and payrools also made a new post-recession high. All in all, a good report. I have a new post up at XE.com, contrasting the slowdown in US manufacturing vs. the strength of the US consumer economy. This morning the National Employment Law Project (NELP) released its annual update on real wages during the recovery. Their findings are a puzzle to say the least. Note that the OES is calculated through May of each year, so the latest report misses the effect of the big decline in gas prices in the last 12 months. 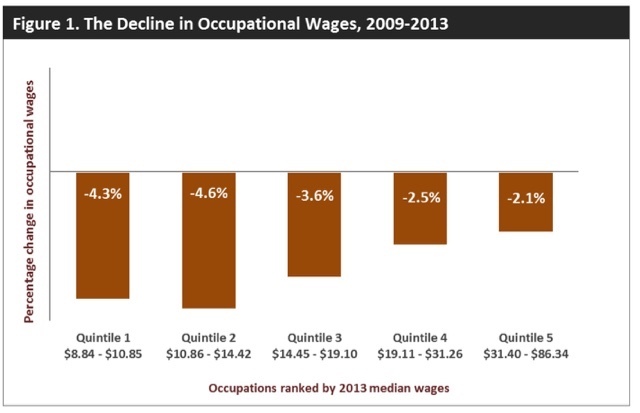 In case it isn't obvious from the graphs, according to the NELP, wage declines have increased across every single wage quintile from 2012 to 2013, and even more in from 2013 to 2014! Even with the NELP saying that hiring in high wage jobs took off in 2013 into 2014. 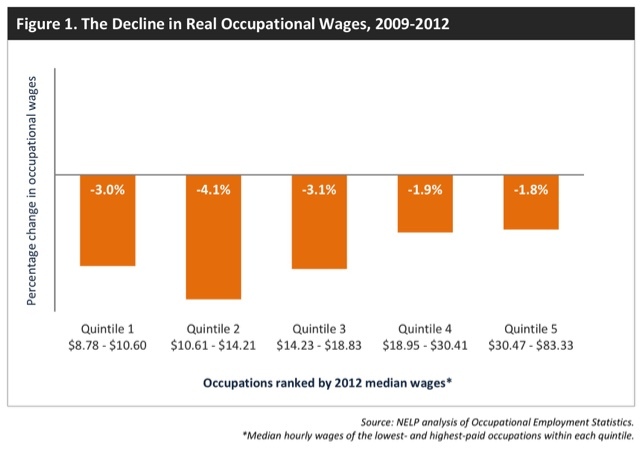 The NELP shows real median wages down -4.0%, not -.3.6%, since 2009, so they appear to be using a different inflation adjustment. 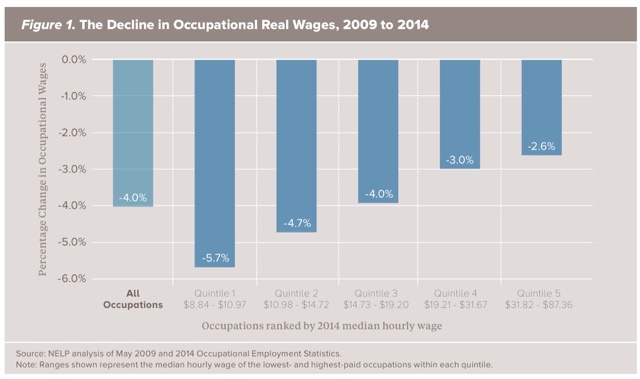 But more importantly, the OES data shows not just a continuous decline from 2009, but the decline in real wages actually *accelerating* from 2013 to 2014 -- much moreso than during the much weaker labor market of 2009-10! I'm at a loss for an explanation. This data cannot be dismissed as at outlier because it is very thorough. 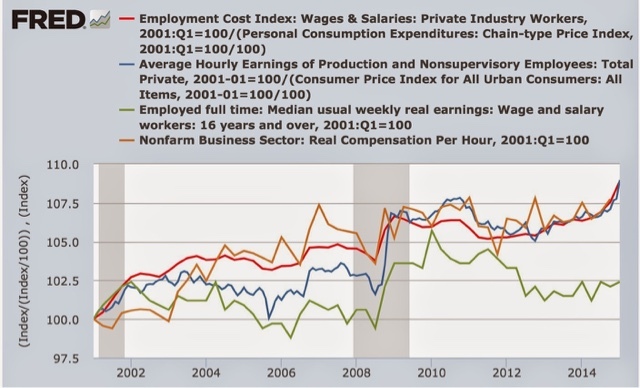 But still it is not at all in accord with what other data on real wages have been showing. Is it possible that there has been a dynamic process where ever more employers are learning that they can freeze employee wages and get away with it? This is a real puzzle. One of the best economic indicators for the electoral success (or not) of the incumbent party in Presidential elections has been whether the unemployment rate during the 2nd and 3rd quarters of the election year is declining or not. Among economic indicators, the unemployment rate is unusual. In and after recessions, it is a lagging indicator. At economic peaks, however, it is a leading indicator. In other words, it is overly sensitive to the downside, turning negative before a recession, but remaining negative after the recession is over. One good way to anticipate the unemployment rate is to look at long leading indicators. 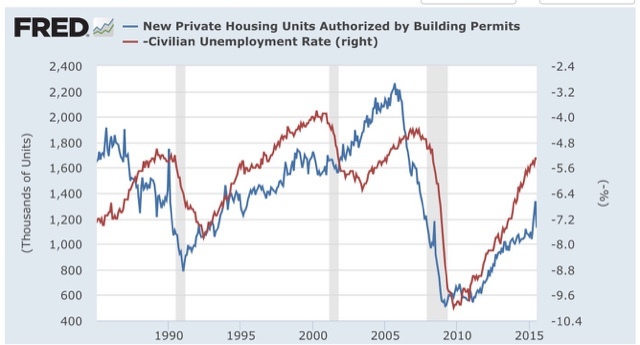 Specifically in this post I am going to examine the relationship between building permits and the unemployment rate. 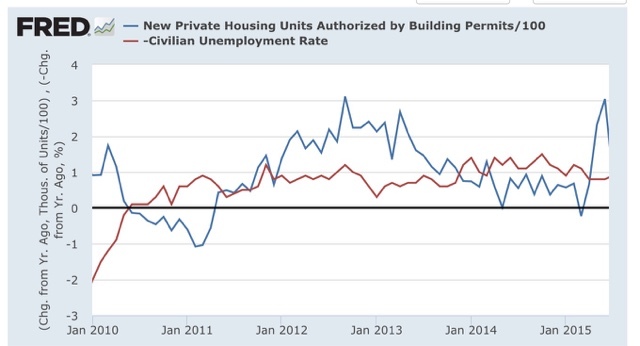 The interactive graph of housing permits and the unemployment rate can be found here . The median number of months by which the unemployment rate lags housing peaks is 12 months, and for troughs is 10 months. That tells us that the unemployment rate should continue to trend lower through at least about next May. That permits lead the unemployment rate is obvious . 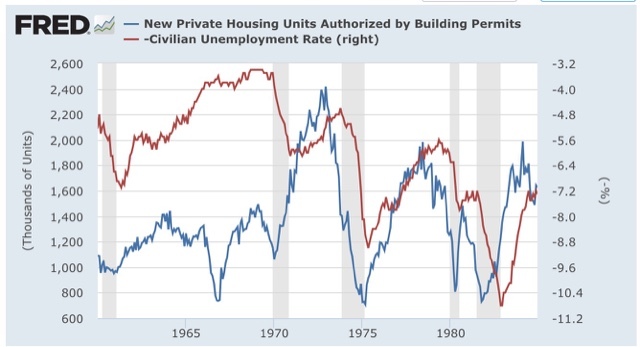 Further, we can say with certainty as to the last 50 years that when housing permits have advanced by more than 10% YoY, the unemployment rate YoY has never turned negative. 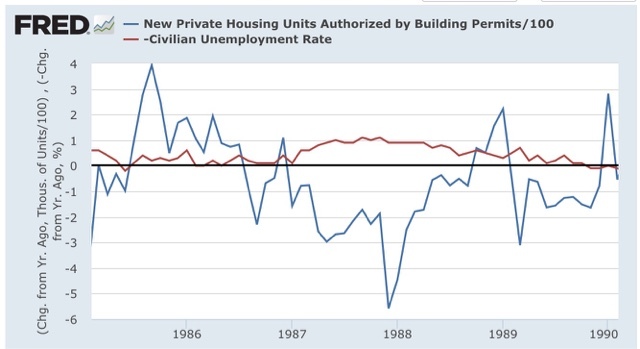 Similarly, with one exception (December 1987 and January 1988), whenever permits have been negative by more than 20%, the unemployment rate has always turned negative. Unfortunately, from December 2013 through April 2015, permits while positive were up by less than 10% YoY. Here the record is more mixed. In the last 50 years, there have been similar slowdowns 8 times. On 4 of those occasions, the unemployment rate never turned negative YoY. On the other 4, unemployments did turn negative. Conversely, in the last 50 years, there have been 6 times that permits turned negative, but less so than 20%. Of those occasions, the unemployment rate also turned negative YoY twice. In the remaining 4 times, the unemployment rate YoY remained positive. 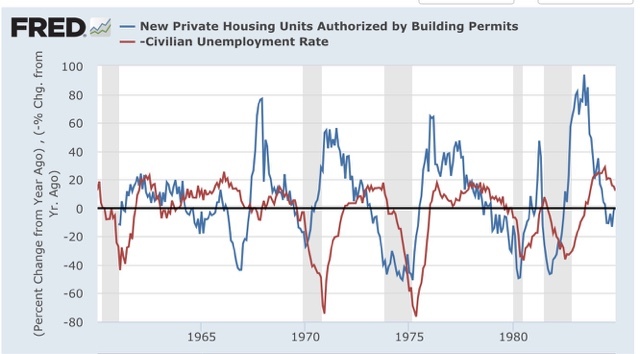 Turning back to the 4 occasions where a slowdown in the growth in housing permits led to a YoY increase in the unemployment rate, the lead times were 8, 13, 13, and 14 months on the way down and -1, 2, 6, and 14 months, respectively. 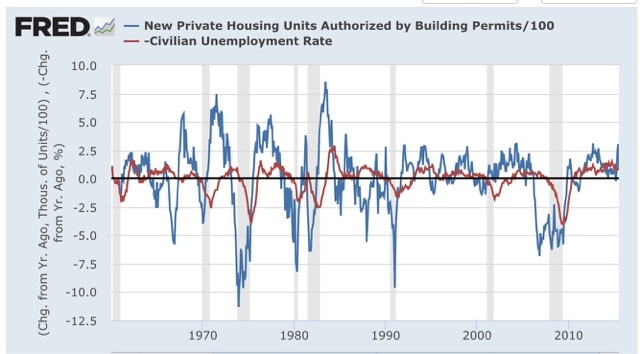 In other words, if the slowdown in permits that began in December 13 were to have led to a YoY increase in the unemployment rate, based on the admittedly limited sample we would expect that downturn to have already started, and a coin flip as to whether it would already be over. 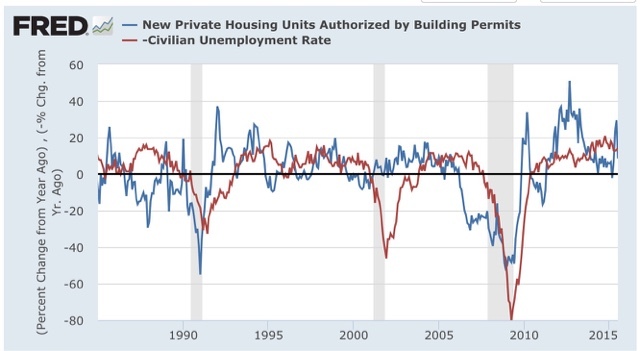 Even where there has been a downturn in permits without a recession, the negative turn in the unemployment rate began between 2 and 11 months later, and ended from 1 to 12 months later. Finally, the trough in the unemployment rate has followed the trough in permits (including both slowdowns and downturns) by a median of 5 months. Since the YoY trough in permits occurred in April 2015, this means the YoY trough in the unemployment rate should occur this month (September) and almost certainly no later than April 2015. While the same general leadling/lagging relationship is apparent, this measure highlights how unusual 2014 was. Permits increased YoY generally all year, but only slightly, i.e., by less than 100,000. In the last 50 years there have been only 2 similar periods, 1962, 1968 (somewhat), and 1986 (shown in the graphs below). Typically, permits have merely "passed through" the range of 0 to +100,000 YoY on the way to a stronger expansion on the way up, or a recession on the way down, so the extended pause was anomalous. In 1987 and 1988, the unemployment rate gradually tailed off YoY from a decline of -1.0% to -0.5%. 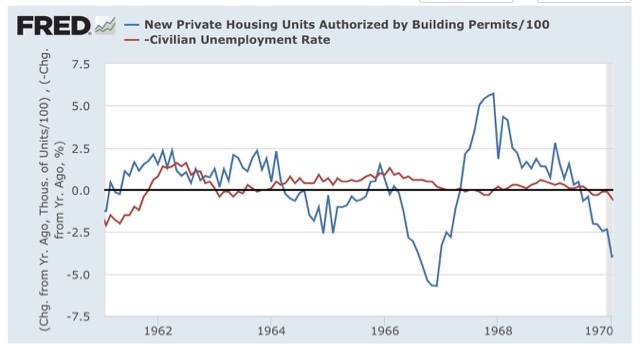 Permits in 1968 were very gradually decelerating until they outright declined in 1969. The unemployment rate in 1969 gradually rose into the 1970 recession. 2. Based on past incidents, we should be near the maximum point of that slowdown. 3. The softening in the YoY decline in the unemployment rate should pass by the 2nd quarter of 2016. 4. In the worst case scenario for the incumbent party, based on 1962-63, the unemployment rate might rise slightly over the next few months before resuming its decline by the end of this winter. 5. The most likely scenario is that, with some monthly variation, the unemployment rate should continue to decline through at least through next March, and probably through next May. Beyond that is presently unknown. This is good news albeit preliminarily for the democratic Presidential candidate. So why is it that most economic writers appear to think the defining element of a labor market recovery after a recession is the number of jobs created? Isn't the better measure the amount of cold, hard cash it is delivering to workers? That, dear reader, is measured by real aggregate wages, and that, I believe, is the best measure of labor market recoveries. The interactive FRED graph of real aggregate wages can be found here. An interesting aside is that the "Reagan recovery" of the 1980s is either great or mediocre depending on where you measure. In the first 14 months, real aggregate wages grew 7.9%, or a blistering .56% a month! In the last 69 months, however, they grew only 9.3%, or a miserable .13% a month. Had I measured back from the end rather than forward from the beginning, the current labor market recovery would be stronger. We can immediately see the effect of labor bargaining power, as all of the economic expansions before the 1980s showed far faster real aggregate wage growth per month than any expansion since. On a per-month basis, the current labor market recovery is only better than the George W. Bush recovery. Over the total recovery, the current recovery is only better than the George W. Bush recovery, and the 6 month recovery at the end of Jimmy Carter's term. But because it is longer lasting, however, after 69 months the current labor market recovery has a better record than the short-lived recoveries of the 1970s and the brief 1981 recovery as well. By this measure it only lags the 1990s recovery as well as the 1960s, and, depending on whether you measure forward from the beginning or back from the end of the 1980s recovery, the current recovery is slightly worse, or significantly better than that labor market recovery. Should the current recovery last another 24 months, it will probably surpass the Reagan recovery by either measure. The bottom line is that the record of this labor market recovery is mixed: poor monthly growth due to nonexistent labor bargaining power; but good total growth based on its persistence.